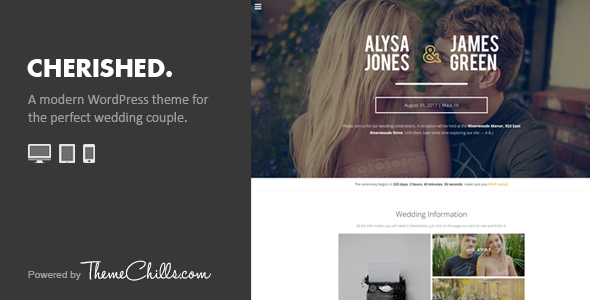 Cherished is an elegant, clean and beautifully hand crafted responsive wedding WordPress theme. With a large collection of native WordPress features you can be sure that you will get the wedding website you deserve in just a few minutes. Want to see how easy it is to setup the Cherished WordPresss Theme? Click here to watch the full video walkthrough. Outstanding theme/documentation/customer service. I’ve never created a website, Wordpress or otherwise. Leo’s video tutorials and documentation made it a breeze. As the groom I’m not expected to do much in the way of wedding prep (thank god for that) but it’s nice to feel I contributed and that people appreciate the quality and effort. Maybe now again I’ll give credit where it’s do. (ThemeChills) Most of the time I’ll just bask in my own false glory. Cheers! The developer of this theme is quick to respond and very helpful. He went out of his way for me, and even helped solve a problem that wasn’t even related to his own coding. I’ll definitely look to use his themes on future projects. Really great theme!! Support is AMAZING! highly recommended!! Easy to customize, simple and RAD! Cheeeers! Amazing theme!!!! Great job!! And the Author is very helpfull!!!! Thank you!! I have bought this theme for our wedding site, and had a questions about it and the developer was really responsive and had a customisation ready within minutes. I love the look and feel of this theme. Superb theme, with excellent documentation. After sales support is also second to none. A highly recommended theme for anyone. Really well done and easy to implement. Excellent support. 3 High Quality Video theme walkthrough and setup. Will my site work on mobile phones automatically? Yes, the responsive design of the theme ensures that your site will not only look good but fully work on phones and tablets. Can this theme be used for something other than a wedding? Absolutely. Change events, images, forms and more. The theme is fully customizable and can cater to your specific niche. Can I use this theme in my language? Yes, the theme comes with a .pot file which you can use to translate the theme to your very own language. As a bonus it has already been translated into Spanish free of charge.